Despite the fact that most people will think of cars when hearing the phrase “drunk driving,” the term is really filled with infinite possibilities. For example, you can’t drive a motorized beer scooter while under the influence, at least not in Australia. Police spotted a 22-year-old riding around on his motorized cooler in the middle of a suburban street, reports The Telegraph. And in Australia such a cooler is known as an “esky,” providing a prime pun opportunity. See, because “eskypade” can then be a thing. When officials caught up with the man, he appeared to be under the influence of alcohol — alcohol which he could’ve gotten from the cooler he was riding, which contained a supply of booze. “This motor vehicle would only be able to travel at very low speeds, the lighting devices on said vehicle would be negligible and make it very difficult for other motorists to see,” police said in a statement. 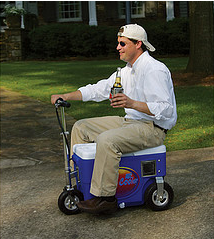 Apparently this sort of thing isn’t out of place Down Under — another guy was busted for allegedly driving an esky filled with beer, cask wine and bourbon pre-mixed drinks on a bike path in March, while a man was arrested in 2011 for taking his “extreme cooler” for a test drive while drunk.